It probably says a lot about me that in the dead of winter I still have a bottle of uni-student-budget-friendly Moscato handy. Yep, it says that I am prepared for any drink-making eventuality, including the one where I make a really bitter drink by accident and realise it can only be saved by something sweet and fizzy. Never mind that it also says I am so disorganised that I totally forgot to drink all the Moscato in summer (when it would have been added to a shot of peach or apricot nectar in a cheap imitation of a Bellini) because it was buried beneath all the bottles of gin. Anyway, it proved useful today when I was craving something citrus-y and had a few mandarines and some Cointreau Noir hanging around (as you do). Side note: just as you say tomato and I say Bloody Mary, some people say mandarines and some people say mandarins. In reference to the fruit, I’ve always said mandarines, while 52 Cocktails’ CTO (Cocktail Tasting Officer) has always said mandarin. To me, a mandarin is a Chinese bureaucrat, or a type of collar on typical Chinese clothing, or a reference to the Mandarin Chinese language, while a mandarine is smallish orange-coloured citrus fruit with a thin, easy-to-peel skin, a refreshing fragrance and segmented, juicy innards. And since I am in charge of this write-up and the CTO isn’t, well, what I say goes. So if I say mandarine I mean the fruit, and if I say mandarin I mean, well, mandarin. 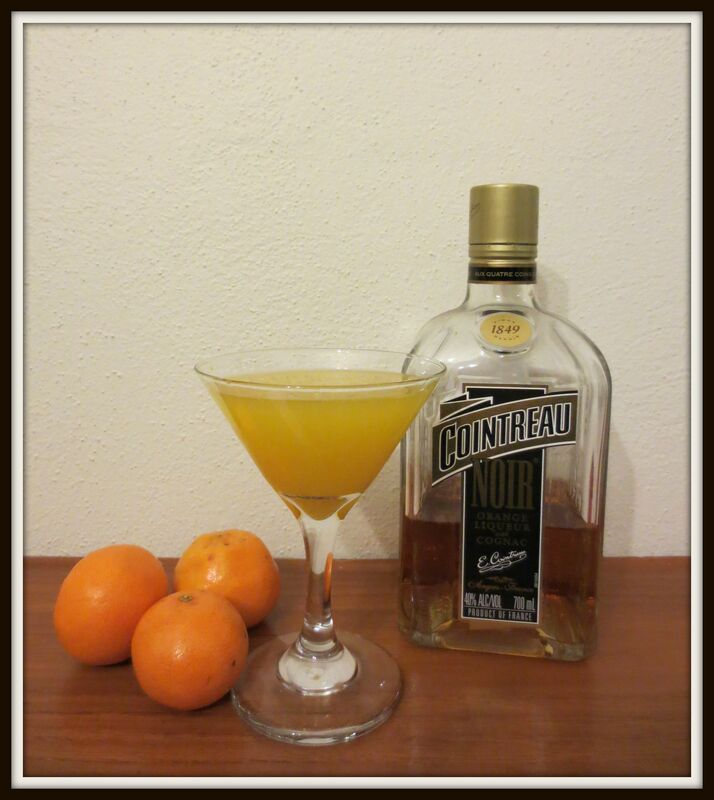 So, as I was saying, I had some ingredients on hand and combined them, and the result is the Bitter Mandarin. Ah, the stress relief that comes with bashing the sh*t out of a helpless piece of fruit – er, I mean, this one’s easy. This one was invented by 52 Cocktails. Well, that depends on who you ask. I’d say it tastes bitter (from the mandarine peel, not the bitters themselves), and mandarine-y. A bit like an Asian digestif. The CTO says it’s like a palate-cleansing sorbet and claims, “It’s not bitter at all, but then I’ve been drinking wine all night, so…” We agree that it does not taste like there’s any alcohol involved (which some people might say is the sign of a good cocktail) but suggest you do not serve it to under-18s just in case.